For the last 23 years, TT Games has been making all manner of games full of studs, bricks and other Danish building blocks. 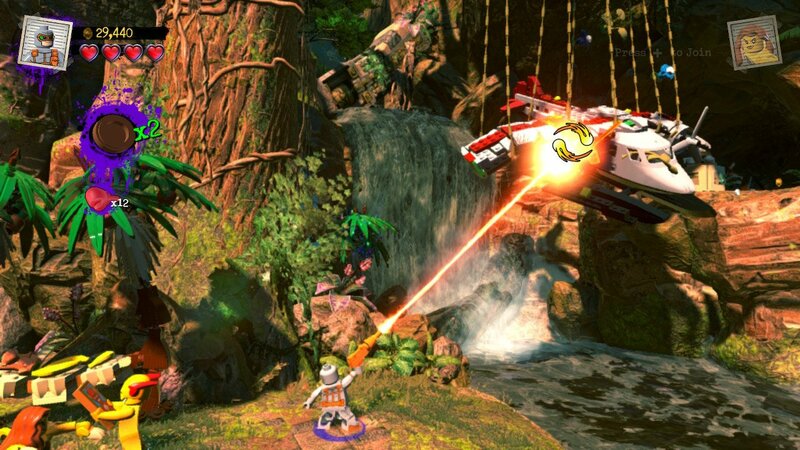 The LEGO series, in its many forms, has hardly been a bastion of consistent innovation but has always offered a fun and safe place for some light platforming and basic combat. 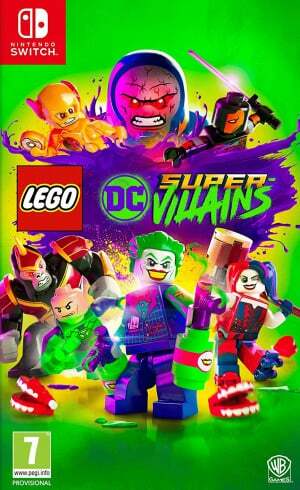 LEGO DC Super-Villains doesn’t break this tradition - with only a handful of ‘new’ changes - but that doesn’t stop it from being an enjoyable entry regardless. Considering this is technically the fourth instalment in the DC Comics-based series, you’d think another game involving Gotham, the Joker and the Bat Family would fall into the same predictable story beats. But, as its name suggests, this game is all about the big bads and it’s 100 percent better for it. With some familiar voices from across the years lending their instantly recognisable tones - including Mark Hamill’s incomparable Joker and Michael Ironside’s booming Darkseid - it’s already off to an authentic start. Even the likes of Kevin Conroy (Batman) and Michael Rosenbaum (The Flash) are here (but you’ll blink and you’ll miss them). With the dastardly Justice Syndicate arriving from Earth-3 and seemingly beaming the Justice League to their own dimension, the Legion of Doom suddenly finds itself having to gather together its most powerful members and potentially perform some uncharacteristically heroic deeds. The result is the chance to play as a rogues' gallery of characters we’ve always fought from the other side, and it makes for an eclectic new roster. Clayface can change his shape to mimic other powers or pose as another character in order to gain access to new areas, the Joker can recruit goons to perform unique tasks and Reverse Flash can enter the 'Speed Force' to create super-builds in spectacular fashion. However, the ability to create your own character is now placed centre stage, enabling you to design and customise your own infamous baddie and personalise everything from their costume right through to the colour of their powers. Your character is mute, in true classic LEGO game fashion, but as you progress you’ll gradually unlock more and more abilities that will make your unique villain a force to be reckoned with. Custom character building has been present in the series for years, but it’s always been tacked onto the side as an added - but ultimately pointless - extra. Here, TT Games takes full advantage of the concept by periodically unlocking new pieces for your mini-fig as you complete each of its 15-plus levels. You can personalise your avatar at any time from the menus, including the power to take on super-speed (complete with a jittery idle animation) and an enemy-clearing slam attack. Despite having such an impressive roster of bad guys to unlock (there are over 80 in total) and utilise, don’t expect a story that sees them embrace their villainy to their full potential. This is no DCEU-esque Suicide Squad spin-off. 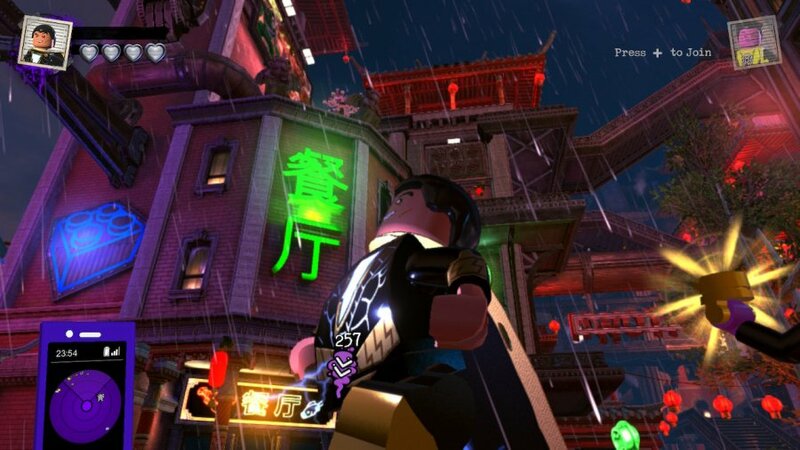 It’s a shame that TT Games hasn’t attempted to at least incorporate a little more bad guy activities into the mix; there are races to complete and things to vandalise, but this is a LEGO game after all, so sugar-coated naughtiness is the order of the day. It seems almost a waste that you're being the bad guy but can't entirely indulge your truly wicked side. The Switch version happens to be one of the best ports the multi-platform series has produced yet. Once again, you’re getting access to the full version of the game playable elsewhere, with high-quality assets (you barely notice the jagged edges and occasional use of blurring), dynamic lighting and very little slowdown. There are also some relatively short loading times overall, which is a pleasant surprise considering how big the central hubs are. It runs consistently well in both docked and undocked modes, so need to worry about a drop in performance if you’re collecting studs on the go. There’s also support for drop-in/drop-out co-op - as is custom with the series by now - so you can split your Joy-Cons or grab an extra Pro Controller for some team-based action. Using co-op can get a little hectic when in tabletop mode, so we found sticking to the TV is the best way to play with a friend. 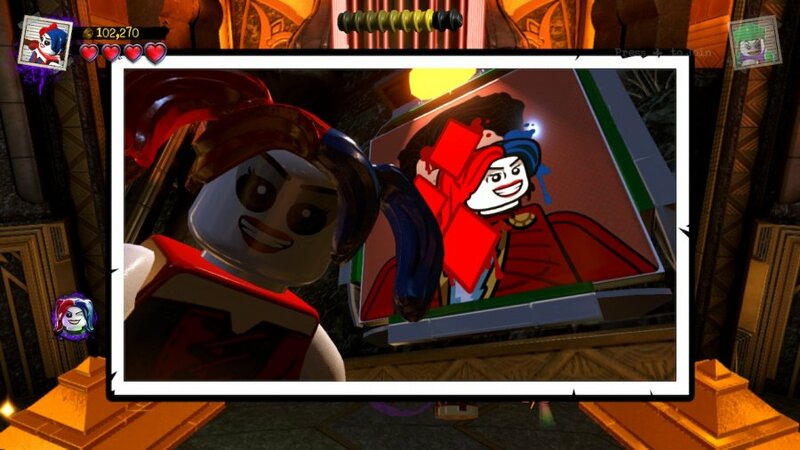 As you’d expect, LEGO DC Super-Villains doesn’t make many attempts to change up the formula that’s served it so well for so long, but with a vast library of well-applied and famous baddies to draw from it offers a far more engaging and memorable story than the stretched-too-thin LEGO The Incredibles. However, with a brilliant cast on hand (can anyone really compare to Hamill’s Joker? ), a vast sandbox hub and all the customisation options you could want in Danish brick form, this familiar playground still has bags of charm. Mark Hamill’s Joker: Do I really need any more incentive? I usually pick up Lego games on sale and play one a year. Played Lego City Undercover when I got my switch. Still have the Marvel one to play this winter. This will be next and I'm skipping Incredibles from what I've read. Sounds right? My son is playing through it right now I haven't had the chance to play with him yet. Still hyped to play it! Games where you play the bad guy are always a good change of pace and I've never delved into the Lego games either. Honestly, it’s been a while since the core Lego game formula has grabbed me. They were the only games I’d play when I was younger, but now it’s just the same game with different stories. That’s why, for me, Lego Worlds is the best Lego game in ages. Wait, Michael Ironside is in this? Damn, that's pretty neat. Good to see Hamill back, even though he keeps saying he'll stop playing the Joker, he seems to keep coming back now and then. Why do so many LEGO games on Switch have such an awful icon? I know only it’s a very minor thing, but The Incredibles and now DC Super Villains are particularly guilty of this! @Balta666 Agreed, the last one I really enjoyed playing was Lego Batman 2: DC Super Heroes on Wii U. As for Lego City Undercover, I thought the writing was exceptional, but unfortunately, the gameplay was pretty much by the numbers. Game is awesome. Fav LEGO game on Switch. I just want a Lego The Last Jedi. @HailKaiba I'm hoping they're waiting until episode 9 so that they can bundle both movies in one game. Episode 7 having one game for itself was pretty neat, but you could also tell they were really scraping the bottom of the barrel for levels. I have to say I disagree with this. In the main city areas the FPS drops horrendously and it's like playing the game in slow motion. @CapricornDavid Yeah, that’s true. If that’s what they’re doing I’ll gladly wait for it! I just hate the concept. DC have such boring heroes that even they know their villains are much better. i hope lego city undercover gets a sequel loved the first one. @nessisonett DC universe has awesome heroes. Nothing wrong with the heroes. The problem is more with Warner Bros having terrible writers. One bright spot was the Wonder Woman movie. That was actually decent. Bought this for my kids and they played it all weekend long. They really seem to be enjoying the game and the character creator. I haven’t had a chance to play any co-op with them yet but it looks fun. 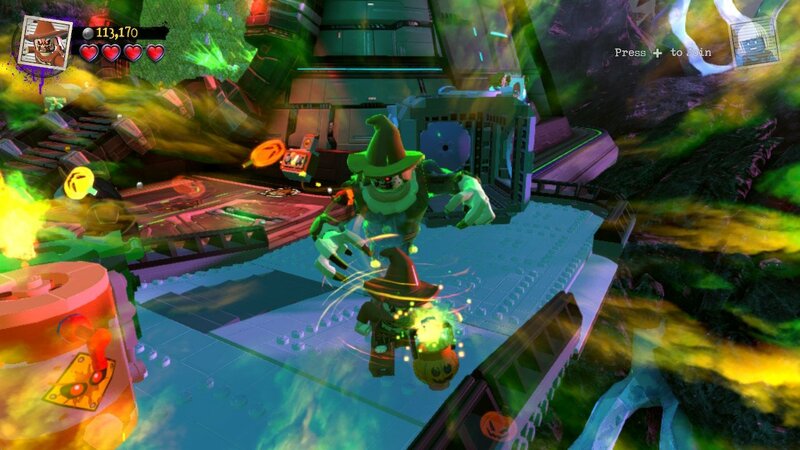 Personally I always found all Lego games besides Lego Worlds to be terribly boring, but they are definitely kids games at their core. @Jeronan, I completely agree with you., DC in my opinion has the best characters be it hero's or villains and for me DC's comics are hands down the better comics, even in the animated department DC has the better animated tv shows and animated movies. My alltime favorite comic adaptation happens to be The Watchmen. Overall though Marvel does have the better live action movie adaptations for their comics, its just a shame Warner has drop the ball in that area for DC's comics. @Romeo-75 plus WB drove off 2 of the big actors playing superman and batman away cause of WB screw ups with the DCU. @shaneoh: Still the best version of Joker IMO. @Romeo-75 Completely forgot about Christopher Nolan's Batman Movies. Those were just downright amazing! No one will ever forget Heath Ledger's Joker! What a ride that movie was when I saw it first time in the cinema. So we have to give WB some credit for those. Like most LEGO games, I Get them on sale later on. The Incredibles is already $34. So that is up next. LEGO games not worth $59 dollars. And you always have a backlog of them for the little ones. @PrincessBowsette, Henry Cavill is the best Superman ever I can't believe they let him go. @Jeronan. Those are good movies and Heath Ledger was awesome as the Joker, I even loved Jack Nicolson's Joker he had so many great one-liners. We are so overdue a new Batman live action movie. @Romeo-75 @Jeronan DC ruined Watchmen with the awful Doomsday Clock that had no input from Alan Moore. Overall, I'm not as big a fan of DC as they're too black and white for me. Superman = Good and Lex Luthor = Bad. Batman = Order and Joker = Chaos. I think I prefer the lines to be a bit more blurred without the heavy-handedness of some of the weaker Batman morality issues. @Jeronan not sure I agree that Nolan's batman films were amazing. Guess depends what you want in a comic movie. I am a huge batman comic fan and Nolan obsession with realism did nothing for me. That batman sucked, watch the fight scenes for example. Absolute joke. Batman himself looks out of place in this ultra realism universe. Seriously they are not great batman movies. Great game, the graphics are the best so far out of all the Switch Lego games. I swore off all future LEGO games after The Incredibles. I figured that if I can't figure them out, and my kids (ranging from ages 6 to 13) can't figure them out, then what's the use? Then along comes Lego DC Super Villains with Mark Hamill's Joker. Pre-ordered, received and playing day one. I've really been enjoying this game. I have played DC Universe Online a long time too. Mark Hamill voiced the Joker in that one too. Really fun game. Still go back to it from time to time. Hadn't played a Lego game for years, but picked this up because of my love for all things DC. Just completed the first level and so far I'm having a blast! Solid performances, great writing, fun levels and designs. Just wish they could get the framerate from an uneven 30 to a solid 60 like on the other consoles, but that's just nitpicking, as aside from that, this is great so far! I've only played one Lego game and that was Lego City, but I've yet to find one that I think compares. It's the theme that puts me off. I'm not a Marvel fan more DC, so may be this could be the one, I have been watching Gotham. I wonder if this compares to City? These games are always solid. (minus Lego City). Good times. @zool Lego City is the worst of them all. I sold my copy. If you liked it at all, you'll like any other one, more. Wait, so this is basically Lego: Forever Evil? Awesome! When I heard about this I figured it'd be Suicide Squad with more villains, but this actually sounds like a lot of fun. Lego games aren't really kid's games so much as lighthearted, no pressure fun games, a lot of the (Lego) titles like LOTR, Harry Potter, Star Wars, Indiana Jones, Marvel & DC related titles, ect. have a lot of adult appeal in gameplay, they are games you can just F**k off with, see how silly you can be, ect. remember I mentioned the WB's "The Flash" ??? you know Barry Allen's dad, accused of killing mom and being imprisoned for like 15 years ??? the actor who plays dad is Barry Allen in the 1990 live version of "The Flash", oh and guess who played "The Trixter" ??? That's right, Mark Hammil !!! whoa, that's some heavy Shnizzit man, so yah, Mark Hammil is almost synonymous with DC !!! I like the Lego games but I usually wouldn't pay more than $20 for them. I'll likely pick up DC Supervillains for the Switch when it drops down in that range. The idea of a game based on DC Super Villains is stupendous. Lego City Undercover is the only Lego I've played, and apart from being too easy and aimed at children (despite the old movie references and humour) They're really chill games to play.